Exhibition stands can be an excellent way to promote your company. There is potential to make new connections and generate new business leads if approached correctly. It’s imperative to focus on how you can attract more visitors to your stand and how to engage with them once they are there. 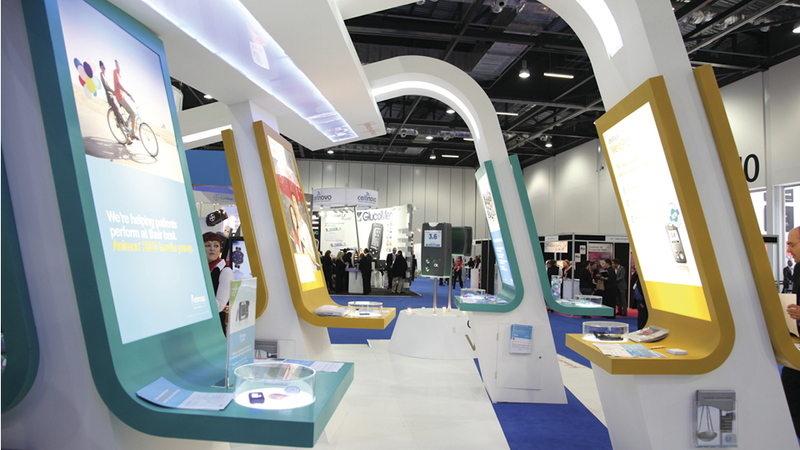 We’ve put together some interesting techniques and tricks that you can use to maximise your exhibition stand impact. It’s vital to make sure your objective for the show – selling, marketing or corporate image —determines the look and feel of your stand. Choose signage, posters and products to display to boost the image you want to create. 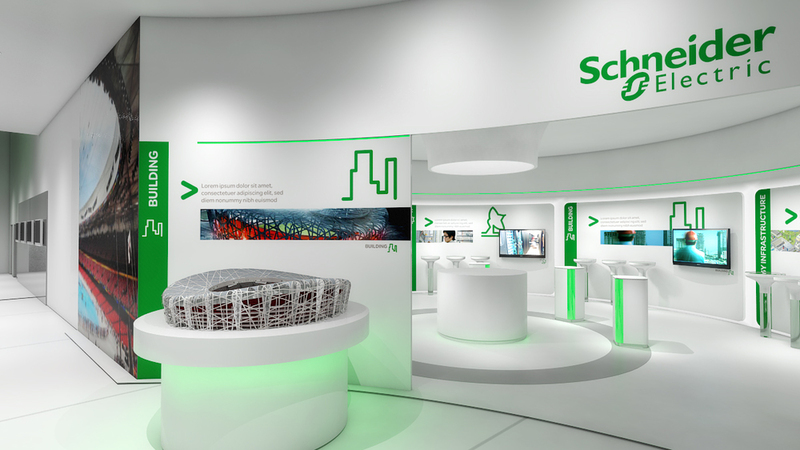 Schneider Electric has effectively conveyed their vision for energy efficiency, automation and renewable energy from plant to plug. Setting up your exhibition stand in your workplace before the trade show will save time and give you a feel for the space you will occupy. You’ll soon see what you can include and what you’ll need to leave out. A hot drink gives you time to engage the visitor in conversation while they wait for it to cool. The caffeine works on their pleasure receptors, creating a positive psychological link with your brands! Experiment with lighting, sound and screens, electronic presentations, posters and signage. Follow the same path as visitors around the stand so you see what they see – both from a distance and up close. Make sure there’s not too much text to read (impossible from a distance) and no visual overload. A lot of money is spent on promo gifts that don’t relate to the message or brand. These often end up on the floor of the exhibition or forgotten in a desk drawer. If you want to give gifts, choose relevant and memorable branded merchandise to market your business. Don’t forget to tell people! Once you’ve created a great stand, don’t forget to tell people you’re going to be at a particular trade show. Upload banners on your website that contain an invitation to customers to come and visit you at your stand and send prospects and clients regular email updates in the week leading up to the show. Join the event organisers’ marketing of the whole event and work closely with them to increase the publicity and, even, link your business name with the event itself. A high-quality video is eye-catching, stimulating and informative. Be sure to include a call-to-action such as “take one of our leaflets” or “scan this QR-code to send us an email” to increase follow-up contacts. Technology and cool gadgets not only help attract visitors to your stand, they can also be a great way of gathering contact details, completing surveys and demonstrating your products. People are far more likely to leave their contact details on an iPad or tablet than a long paper form. Also, with clever software like qbit (developed by Quatreus), contact details can be collated instantly off-site via Wi-Fi or 3G – allowing your sales team to get a head start on your lead nurturing process. One of the most effective strategies in terms of generating quality leads in a B2B context is sharing knowledge by offering free whitepapers, eBooks, reports etc. This can of course also be done online. Get the contact details of interested parties and send them the information via USB stick, email, NFC, RFID and so on. This strategy works best if you approach it intelligently. Make sure that the competition ties in with your product or brand and that it supports the message of your marketing campaign. The Monitor team is committed to providing our clients with a bespoke service tailored to their needs. We lift all kinds of businesses out of the crowd – across every communication channel. Should you require advice with your business exhibition stand, drop us a line or alternatively, contact us on 0161 743 0980.